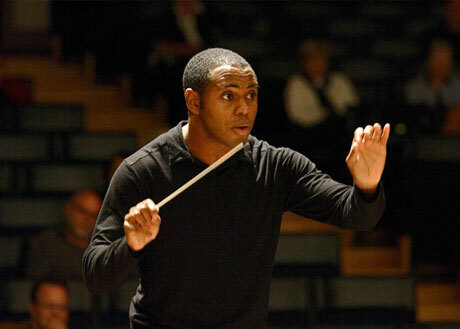 The American conductor Kazem Abdullah is the new musical director of the City of Aachen. His predecessors in this long established post include Fritz Busch, Herbert von Karajan, and Wolfgang Sawallisch. Born in Indiana, Kazem Abdullah began studying music at the age of ten. He graduated from the Cincinnati Conservatory of Music, with a Bachelor of Music in Clarinet. He then studied at the University of Southern California before joining The New World Symphony as a clarinetist under Michael Tilson Thomas for two seasons, after which he continued his musical studies at The Peabody Institute of the Johns Hopkins University. Kazem Abdullah served as Assistant Conductor at the Metropolitan Opera in New York, a three-year post to which he was appointed by Music Director James Levine. In addition to Levine, while at the Met he worked with conductors such as Louis Langree, Kirill Petrenko, Lorin Maazel, and Fabio Luisi. He received the prestigious Solti Foundation U.S. Career Assistance Award award in 2010 and again in 2015. In his first season in Aachen, Kazem conducted four productions: Carmen, Hänsel und Gretel, Simon Boccanegra, and Die Zauberflöte. In addition to his many duties in Aachen, Kazem also made his debut with the Pittsburgh Symphony in May 2013.